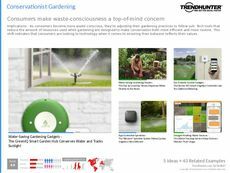 Find Better Ideas, Faster ® with a custom lawn care trend report, our PRO Dashboard and 80+ categories of premium trend reports. 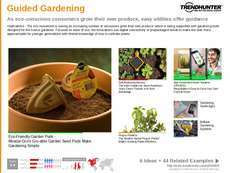 Outlining tools, plants and garden products, the Lawn Care Trend Report covers landscaping products and services offered to consumers. First, we look at lawn care products and machines like lawnmowers -- both motor-powered and more eco-friendly kinetic-powered machines. We also look at fresh turf as well as more artificial methods for keeping a nice lawn, like AstroTurf for industrial sports fields. Finally, we touch on landscaping services offered to homeowners and for public parks. 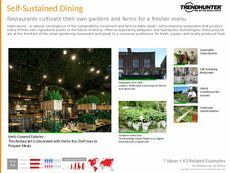 This trend report is a valuable resource for landscape architects, landscaping firm professionals as well as small business owners. 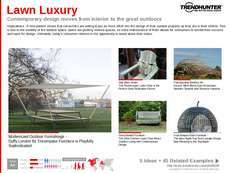 It is also applicable to product developers of outdoor home products and the outdoor retailers that sell such products to consumers. The Lawn Care Trend Report is a compilation of services and products geared toward homeowners who enjoy keeping beautiful gardens, front and backyards.